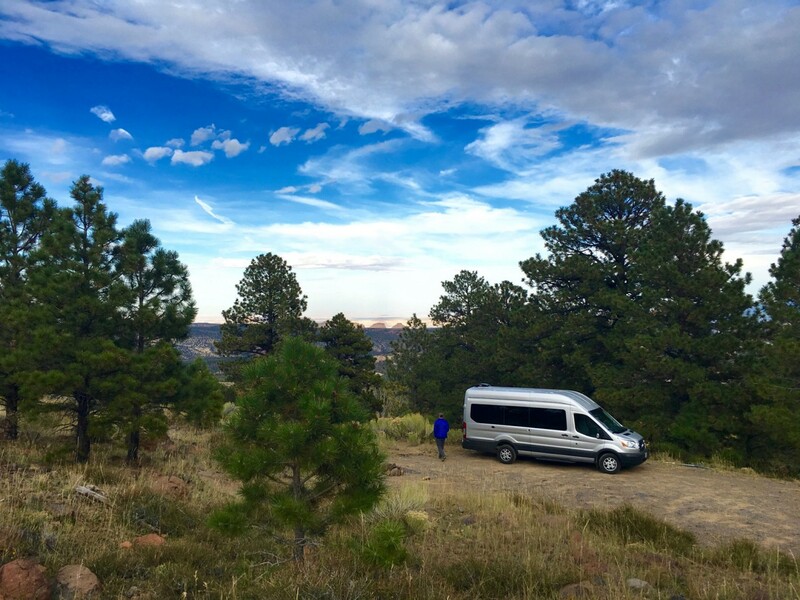 We promised a full report from our original post about the 2015 Ford Transit cargo van conversion upon returning from our five-week, 3000 mile trip to the southwest this fall. 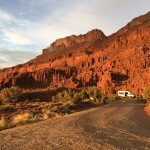 We didn’t make it as far as we intended (Tucson, AZ) because we wound up having too much fun in Utah’s red rock country. THE CONVERSION: With only a couple of exceptions, we’ve done all the work ourselves. So far, we’ve spent just over $2500. Our total investment is far less than half the cost of the $110,000 Sprinter conversion we admired a year ago. FUEL: Overall gas mileage averaged 18.2 mpg. Our fuel costs for the trip were just over $500. INSULATION: Since Ford’s cargo van comes straight from the factory with no insulation, headliner or wall panels, the materials we used— Radiant Barrier, Reflectix, and denim batt insulation seem to be performing well. It’s still a loosing battle because of the windows all around but we think the trade off in great views is worth it. We plan to move with the whims of the weather, anyway. We bought some Ikea door mats right before we left and loved having that extra layer underfoot. CEILING: The white Coroplast (a thick plastic corrugated material similar to cardboard) used to finish off the ceiling worked great. 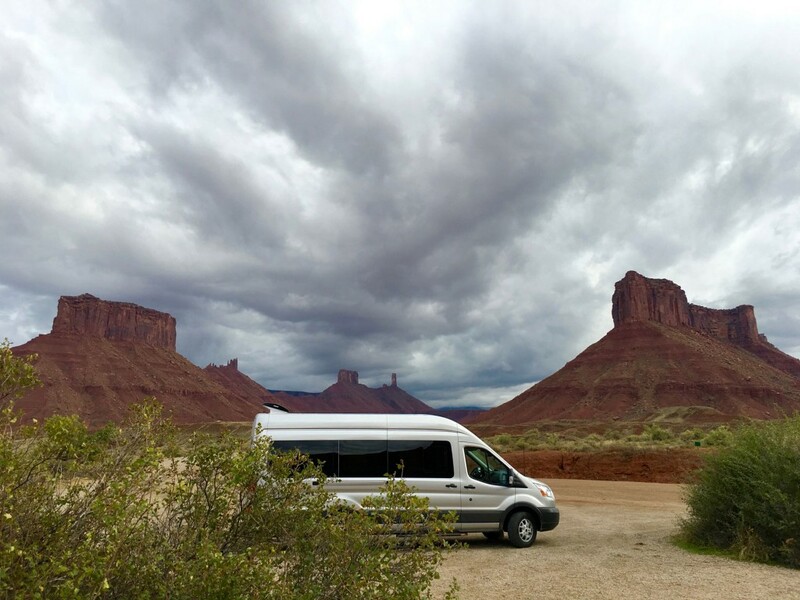 It stayed firmly in place even as we worried about loosing our teeth on the washboard roads in Canyonlands National Park. With over 12 hours of darkness every night, the clean white surface brightened up the interior. KITCHEN: The “kitchen cupboards” we built using the Elfa system were plenty rigorous for 3000 miles of constant flexing inside silver metal box. The re-purposed Ikea desktop used as the counter top suffered a few knife nicks and a little water damage along the front edge. We plan to replace it with 3/4″ paperstone which should stand up to heavy use. The rivet retention pins and blue bungie cords used to keep the drawers from sliding out in transit worked perfectly except when someone forgot them. 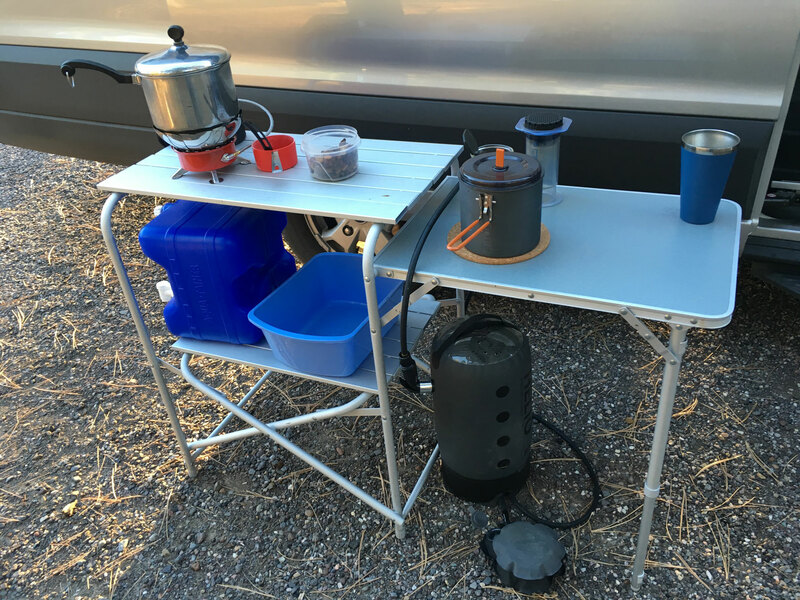 To avoid moisture buildup inside the van, we cooked outside unless it was too windy or wet. The surface area and storage capacity proved to be more than sufficient for our needs. COOKING: To avoid steam buildup inside the van, we cooked outside using the single-burner Primus stove. 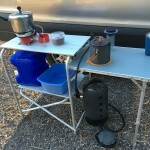 Most of the time, we used the aluminum roll top table or the campground’s picnic table. We have pretty simple tastes when it comes to food— homemade granola on mornings when we wanted a quick start, pancakes or oatmeal for the more leisurely days. Peanut butter sandwiches or Clif bars for a light lunch. A little charcuterie before dinner, usually a rice bowl or salad, sometimes pasta with steamed vegetables. We didn’t have trouble finding groceries along the way to restock. We found that eating out, while easier than cooking, was usually an expensive disappointment and so we’ll will keep those outings to a minimum in future. 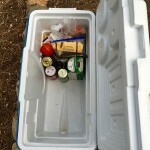 REFRIGERATOR: The Coleman 70 quart Xtreme 5 cooler did a fine job of keeping food cold. After the frozen plastic water containers we brought from home melted, we switched to block ice which lasted upwards of six days. However, blocks are not always easy to find. Once we had to resort to bags of cubed ice once which only lasted two days. We squeezed two store-bought ice blocks in a big plastic bin that filled half of the space inside the cooler which served to contain the melted ice water. You can see from the picture that we really didn’t need that much space for our food. Most of the cooler volume was devoted to ice. BED: The bed proved to be the perfect size for us (48 x 75 or “3/4 full”). Situated the long way, we were able to walk easily from front to back. The 16 inch height allowed us to stow all the bags, cooler, water jugs and extra gear. The mattress itself was a bit too firm for our tastes, however. We came up with a temporary solution by taking the extra down quilt, folding it in half, and sliding it underneath the mattress pad. This helped to soften things up a bit. We just ordered a real down feather bed which should serve the same purpose, but even better. STORAGE: The Elfa drawers provided plenty of storage for our clothes. In fact, we brought WAY too many clothes and plan to seriously cull our wardrobes for the next trip. We wound up wearing our favorites anyway, day after day, so an occasional trip to a laundromat seems to be the best solution. The wire pannier baskets from our road bikes worked well to carry shoes, extra maps and books. Chris dominated the storage areas in the wall cavities for her extra shoes/boots/sandals and hanging an ever-changing collection of damp and dirty socks. (David’s size 13 shoes didn’t fit there anyway). COOLING: The Maxxair Fan in the rear ceiling was super effective in facilitating airflow. We left it cracked at night to mitigate interior condensation. We only used the fan a few times to quickly clear solar-gained heat. However, the remote-control option ($60) proved unnecessary as we could easily reach the fan’s controls. The Reflectix window panels effectively blocked and reflected the sun and provided the insulation we needed on cold nights. With the rear and side doors open, the van actually makes its own shade. We might change our minds when we hit temps well above 80 degrees, but for now, we’re more concerned with heat. We originally thought we really needed an awning, but it has been moved wayyyy down the list of “must-haves”. 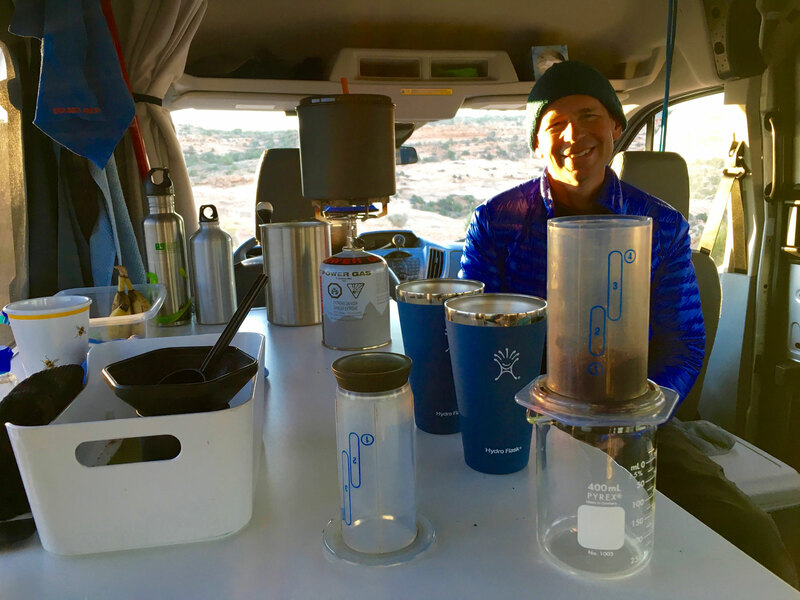 HEATING: Even though October nights in Bryce were pretty darn cold at 36 degrees, the van stayed a relatively comfortable 50 degrees. Our assortment of down quilts kept us toasty warm. 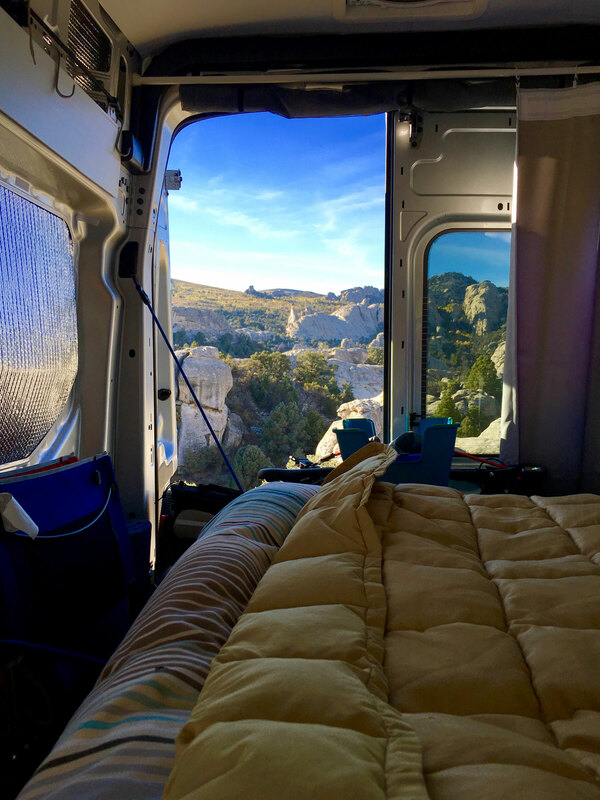 As soon as the sun rose above the canyon walls, the van heated right up. However, when the thermometer inched towards the low 20s in November we knew we’d need to head for home or find electricity to plug in our noisy, ancient ceramic space heater to take the chill off. Which we did, on our final night south of Salt Lake City. Fifty five degrees was as high as the heater could manage when it plunged to 21 outside. We reluctantly forked over $50 at a grim KOA in Springville for the privilege of plugging in. Ouch! Our plans for future trips? Plan A: move with the weather. Plan B: obtain a more effective electric heater. We just tested a few oil-filled radiator type electric heaters which work better (and silently) than than the old ceramic/fan heater, though they are much larger and heavier. We’re still keeping our eyes open for another option. SOLAR: Just before we left on our trip, David got a hefty $5000+ estimate from AM Solar in Springfield, Oregon (to be fair, this was for a top-of-the-line lithium setup, including installation). We decided to see how our inaugural trip south went before pulling the trigger on that investment. We’re glad we did! Other than charging our laptops, phones and a Kindle, we simply don’t use electrical gadgets. We don’t feel the need to watch movies or TV while we’re focused on enjoying the natural world. 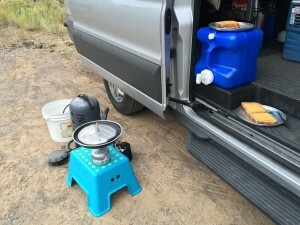 Our one-pot or pan cooking is straightforward, only requiring the little camp stove. 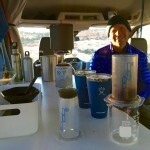 David’s coffee-making routine, even at home, uses a hand grinder and his trusty Aeropress. The factory option inverter we got with the van turned out to be a too weak (150 watt) and has modified sine-wave, so it’s not an option for laptop charging. It worked well enough to charge battery packs while we were driving. A cheap 400 watt inverter that we’d purchased for the pop-up trailer worked much better to charge both laptops while we drove. So, being able to plug in is really only an issue for those times when we don’t move the van for more than a few days. We spent most nights in either dispersed camping areas or at BLM campgrounds with no services except vault toilets. SCREENS and CURTAINS: The screens that Chris sewed from fiberglass window screen fabric worked well for the four pop-out windows as did the no-see-um “sleeves” for the passenger and driver’s side windows. Some of the sticky-back Velcro bits started to slide in the heat but they are easily re-positioned. 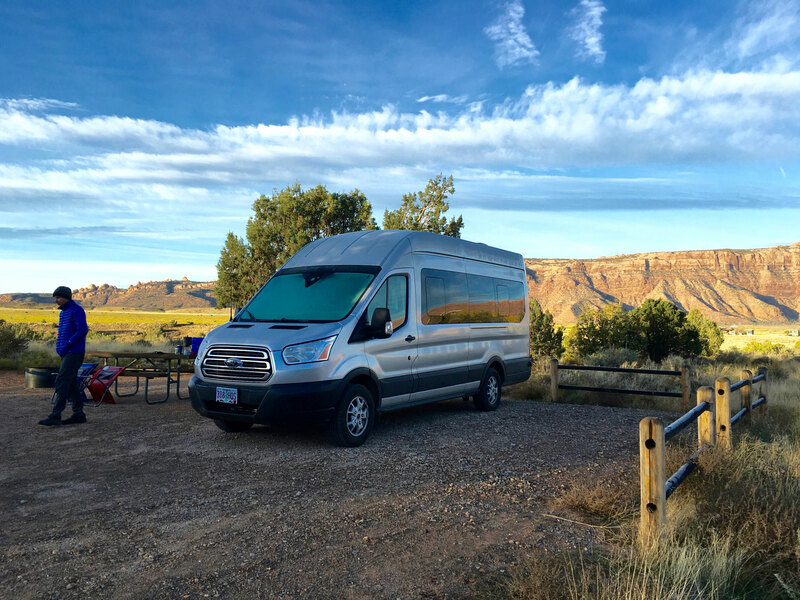 Bugs turned out to be a non-issue in southern Utah, at least in the fall, so we rarely deployed the large screens for the side and rear openings. We used the Ikea black-out curtains and rods pretty much every night for privacy. They also were handy for drying towels and hanging coats. We used the side curtains at night if we needed more privacy. WASHING: One of our favorite items turned out to be the 3 gallon Nemo Helio Pressure Shower (thank you, Kevin!) which we used for daily dish-washing. David even used it to wash the van windows when they got too grimy. We took a few cold showers with it when we were without a hotter alternative. It also provided us with extra water storage. The four 4-gallon Reliance water jugs were kept in constant rotation. We probably won’t bring the tall 5-gallon container along on the next trip. THE HEAD: We’re SOOOooo glad that we didn’t make a bigger investment than we did in our $20 toilet seat/lid combo with gasket. It still hasn’t seen the light of day or for that matter, a backside, since it was stowed far under the bed back in September. We just haven’t needed it. It’s still nice to know the option is there, should the need arise. 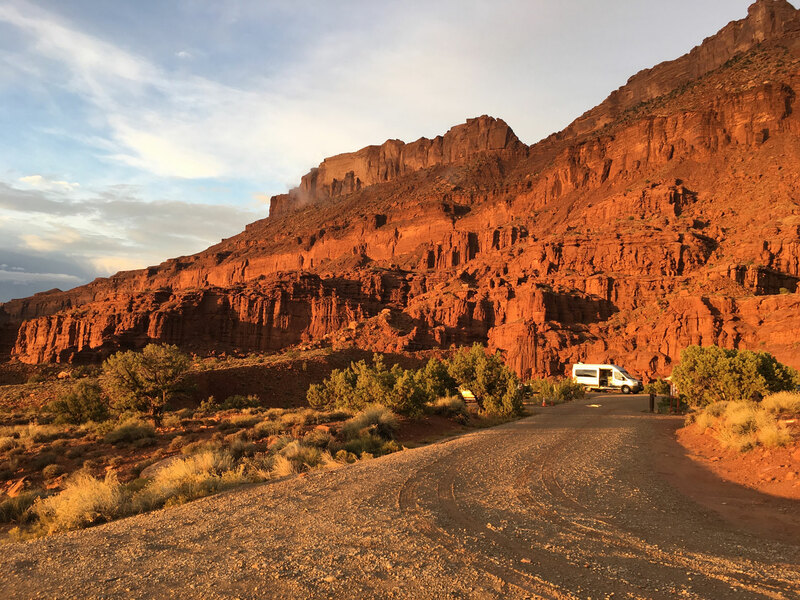 We had heard that dispersed campers in Utah are levied hefty fines unless they carry a functioning toilet, but we didn’t find that to be the case at all. We can both attest that vault toilets have come a long way in recent years, and in both Utah and Idaho, they are stocked and maintained quite well by park employees everywhere. Yay! Some of the national parks even have flush toilets and radiant heat floors. When without, the old trusty hand-trowel to dig a cat hole was all that was needed. 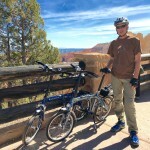 BIKES: We bungied two Downtube folding bikes by the rear doors and pulled them out in Boise and at Bryce Canyon NP. We plan to use them a lot more on future trips. 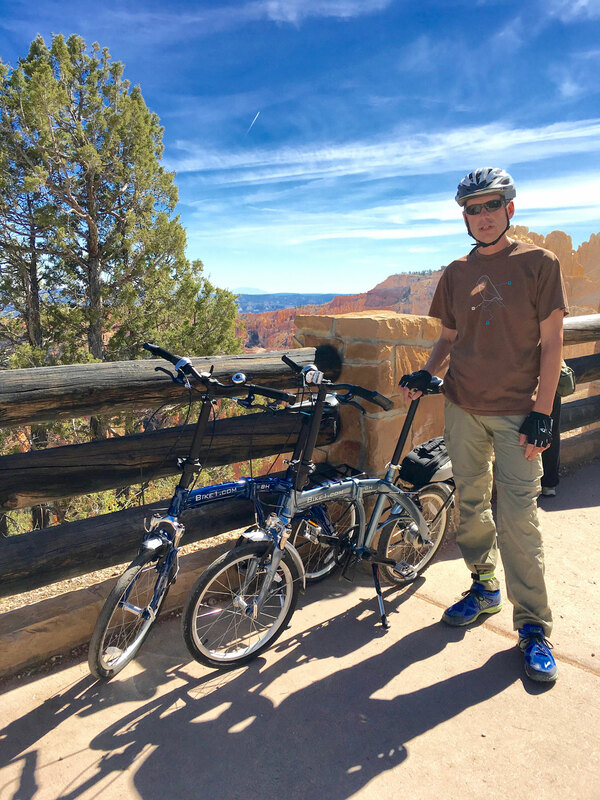 Southern Utah’s rock-and-sand-scape is geared much more towards mountain bikes. 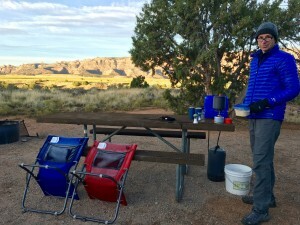 We really appreciated how easy they are to set up and they provided a nice break from hiking. That about covers it. If you have questions, or want to know more, leave a comment! I just came across your blog. Very nice. I love your camper van format! I want to encourage you to look into doing your own solar install if you decide you need it. 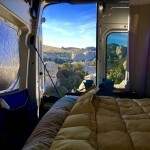 My wife and I live and travel full time in our airstream. I have no particular practical skills and after a couple of months of study, I managed to install an entire solar battery charging system. It powers our 300 amp hours of our lifeline sealed agm batteries. It works very well. I can recommend some links to you if you want to go in that direction. We love having solar. It feels a little like magic. Oh, by the way, our system is 450 watts and cost us quite a bit less than the am solar quote and has very high quality parts. not those cheap $35 controllers. 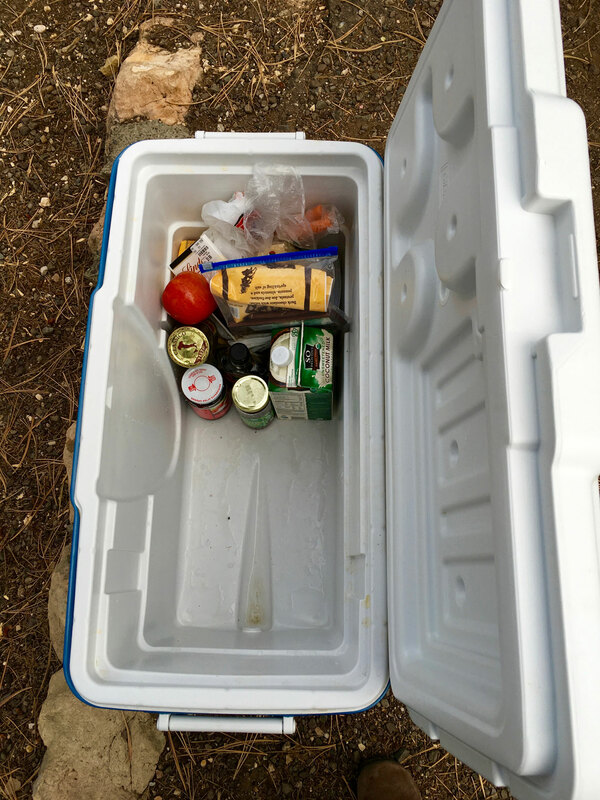 We are planning to swap out our cooler for a dc powered refrigerator (ARB 50 qt) and will definitely need a house battery and probably solar charging as well. Currently, we just charge laptops/phones and have been fine with a small inverter while we drive and the sporadic luxury of electric hookup sites. Where did you get your solar kit? Howdy! Greatly enjoyed perusing your illustrated 2016 Southwest road-trip. My wife and I are considering getting a Ford Transit van (regular height, as we’re both under 6-foot) with the Eco-boost V6 gas engine. You said that overall you averaged 18.2 mpg. What was your fuel-efficiency while cruising highways between destinations? (minus low-gear driving on gravel/dirt side-roads, etc.). That mileage is overall. A mix of highway, in town and gravel side roads. Our van is pretty lightly loaded, so the fuel economy doesn’t change much UNLESS you go fast on the highway. It drops rapidly over 65mph. We did see a drop when we upgraded our tires to a more aggressive tread, but that was expected (17.7mpg according to the trip computer). Have fun with your new van!! Thanks for the informative reply. We’ll indeed choose moderately aggressive traction tires for negotiating rough backroads, plus a 4X4 conversion. So will expect to lose a bit of fuel-economy with those additions. I’ve read some reports of folks who have Transits with the diesel engine routinely getting 20 to 25 mpg—–some even claim 30 mpg while highway cruising! In retrospect, ever wish you would have chosen the diesel engine instead of the Eco-boost V6? Or have there been problems with the Ford diesel that caused you to reject that option? Forgot to ask. How is the feather bed working out? My wife, Jan, has a gimpy hip, so requires a cushy bed to avoid waking in the middle of the night with miserable pelvic pain. Memory-foam pads can be quite hot to sleep on in summer, so we’re hoping the feather mattress might be a cooler alternative. Thanks.